As with pretty much any other topic, most homeowners will have their preferred method of heating their home in Columbus . While many homeowners may swear that their home heating method is somehow or for some reason “the best”, it is important to remember that this simply cannot be true. There is no truly “best” way to heat your home, only what is best for your home. Many homeowners swear by natural gas when it comes to fueling their furnaces, for instance. In truth, though, electric furnaces have many benefits of their own. Here is some information to consider from Quality Air Heating and Air Conditioning. One of the main benefits that electric furnaces offer is the fact that electricity is readily available just about anywhere. You may not live in an area conducive to the delivery of oil, and your home may not have existing natural gas hookups. However, pretty much every home has electricity coursing throughout it. Like natural gas, you also do not need to worry about having your fuel source delivered as you would with oil or propane if you choose to heat your home with an electric furnace. Propane and oil are limited supplies sitting in a tank. Electricity is always there in your home. While many people – falsely – argue that electric furnaces are less dependable for heating your home due to their dependence on electricity, they are missing an important piece of information. In the event of a power outage a natural gas furnace is no more useful than an electric one. Sure, the gas may keep flowing, but the electric blower in your furnace necessary for the distribution of heat throughout your home will be useless. Before purchasing any home heating system, you really need to do your homework. Many homeowners point out the fact that electricity is more expensive to purchase than natural gas is. That may be true in many places. Thanks to the high efficiency with which furnaces are manufactured today, though, a high-efficiency furnace can be just as – if not more – affordable to operate than a natural gas model. 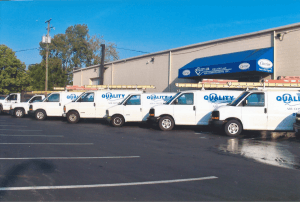 If you are considering the installation of an electric furnace in your Columbus home, contact Quality Air Heating and Air Conditioning. We have the answers to all of your questions. Let the experts help you make the best decision for your home.